On January 14th the Embassy of Italy to the People’s Republic of China in Beijing organized the Sino-Italian Forum for a New Model of Economic and Commercial Cooperation. The Summit was led by the Italian Minister of Economic Development On. Flavio Zanonato, on one side, and the Chinese Minister of Commerce Gao Hucheng on the other side. This event marks the beginning of the new year and new partnership between China and Italy. 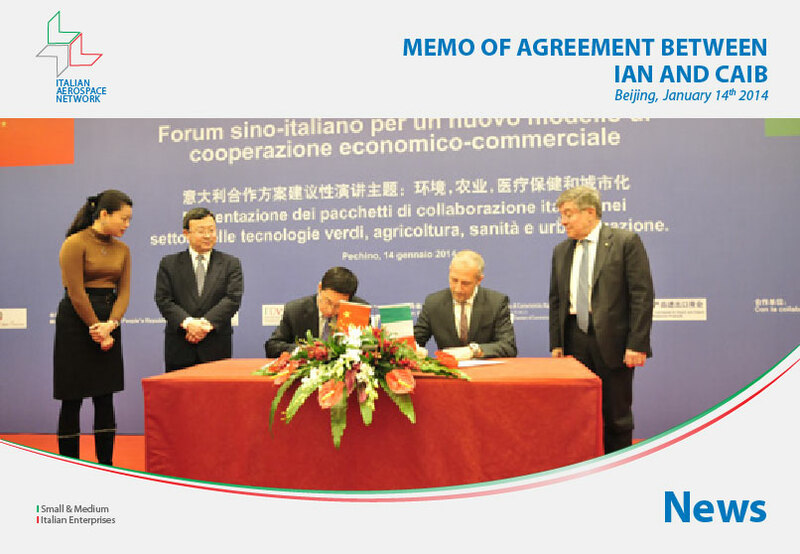 The Italian Aerospace Network and the China Aviation Industrial Base met to sign a Memo of Agreement that focuses the new partnership on promoting bilateral cooperation programs between Italian and Chinese companies. The MoA establishes a mechanism of senior management contact and mutual visit to intensify information exchange and communication between the two parties; Intensify the cooperation in the field of Civil Aviation International Trade and Investment, organize business delegations to develop international market by providing communication opportunities, international conference, enterprise forums and international exhibitions, introduce an information exchange mechanism to release timely investment promotion information, and create a great environment for the investment activities for enterprises; assist enterprises of the other party in carrying out business activities in local areas; send specialists to assist enterprises of the other party to set up wholly owned entities or joint ventures, and help to apply for project funds.